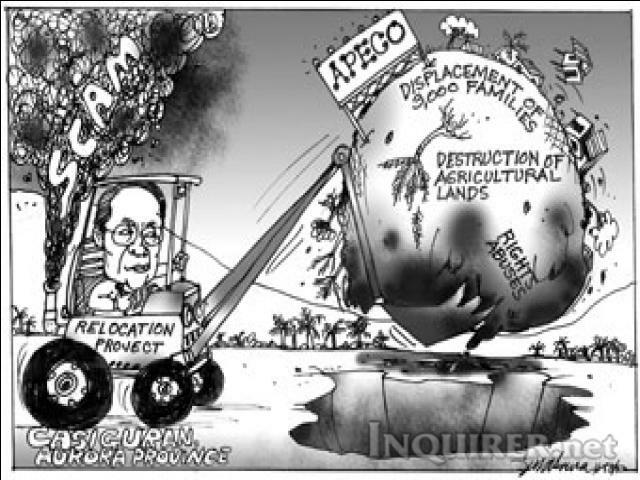 WORSE than C-5.” That is how architect Felino Palafox describes the Aurora Pacific Economic Zone and Freeport (Apeco) in Casiguran, Aurora. C-5 is the controversial P400-million road extension project linking the South Luzon Expressway to Sucat Road in Parañaque and funded by a double entry in the 2008 budget, half of it in the form of “congressional initiatives” by Senator Manuel Villar. Critics claimed the road was diverted to benefit several housing projects of real-estate companies owned by Villar and his family. Apeco, on the other hand, is a P1-billion economic zone that is intended to boost social, economic and industrial development in Aurora and nearby provinces. “It will bring the entire Luzon to the Pacific,” said Senator Edgardo Angara, who authored the bill creating Apeco together with his son Aurora Representative Juan Angara. Apeco apparently is the senator’s pet project, behind which he does not hesitate to throw his power and influence. Last year, as chairman of the Senate committee on finance, Angara sliced off P650 million from the allocation for debt service and added it to the P150-million allocation for Apeco proposed by Malacañang. But for some reason, the heavily fattened pork for Apeco fortuitously remained frozen during the Arroyo administration, leaving the economic zone with only the original P150 million to spend this year. Palafox, who was originally hired to prepare the master plan for the project, now seems to think putting more funds in Apeco would be like throwing good money after bad. “It’s a good project, but it’s at the wrong place and at the wrong time,” he told the Senate subcommittee hearing the Apeco budget Thursday. And what’s wrong with the project? Plenty, according to Palafox. For one thing, no adequate feasibility study or business plan was done before it was undertaken. Neither were there any engineering or hydrologic studies done nor were there plans for an airport or seaport. Other groups have also opposed the project on the grounds that it would displace 3,000 families, including indigenous Dumagats, shift land use away from food production and lead to human-rights abuses. But for Palafox, the biggest irregularity was the relocation of the project to a place that is not only far from the town proper but also prone to flooding and liquefaction. Under the original plan drawn up by his company, there would have been no need to build access roads to Apeco. But they were directed to move the location further from the poblacion, Palafox said. And they would learn later that part of the land in the project’s new location was owned by Benjamin Mina, the provincial environment and natural resources officer. It was Angara who was “running the show,” he added. “It turned out that the owner of the property was one of their own,” Palafox said. Angara, however, explained that it was but natural that he would be involved in the project because it was he who “shepherded” it through Congress. “I have a natural stake in Apeco,” he said. If Palafox is now criticizing the project, Angara said, it was because the services of his company were terminated after the plan, for which it was paid P32 million, was disapproved by various government agencies. “Palafox is a very boastful and dishonest person,” he said. Maybe Palafox is all that, but that does not answer any of the issues he raised. He has not only questioned the financial aspects of the project but also raised doubts about the soundness of locating Apeco where it is now. And he has hinted that somebody profited handsomely from the decision to relocate the economic zone. Whether Apeco is just another white elephant, and a dangerous one at that, is certainly worth looking into. Do we hear anybody in the Senate seeking a deeper inquiry into this matter, like it did with the C-5 project? But wait, all the acrimonious debates in the Senate on the C-5 project actually produced nothing useful except to help torpedo Villar’s chances of becoming president. So maybe, some other agency should look into Palafox’s claims and maybe help save precious taxpayers’ money. On Aurora economic zone, Serge knows better than Ed?